Lectures 21 & 22: Abyssal circulation, thermohaline circulation, and heat transport. Stommel and Arons predicted an abyssal circulation driven by a uniform upwelling of deep water into the thermocline. As they perceived it, the upwelling is such that it balances the downward diffusion of heat through the thermocline. The figure on the right shows the abyssal circulation based on their simple theory. Notice that the interior flow is everywhere TOWARDS the sources of deep water. Is it Deep Western Boundary Currents which carry the deep waters equatorward, away from their source. In the Atlantic Ocean there is a net transport of deep waters to the south, away from the NADW source. Hence, mass conservation dictates there must be a compensating net northward flow at the surface. Together, these deep and surface arms of meridional transport are called the thermohaline circulation (THC), or the meridional overturning circulation (MOC). The thermohaline circulation is global, with the Southern, Indian, and Pacific Oceans playing a role in upwelling NADW back to the surface, where it returns to the Atlantic. Where this upwelling preferentially occurs, and the importance of the Southern Ocean’s role, are very much under debate. To the right is a schematic which suggests that the Pacific and Indian Oceans play only a minor role in terms of upwelling. 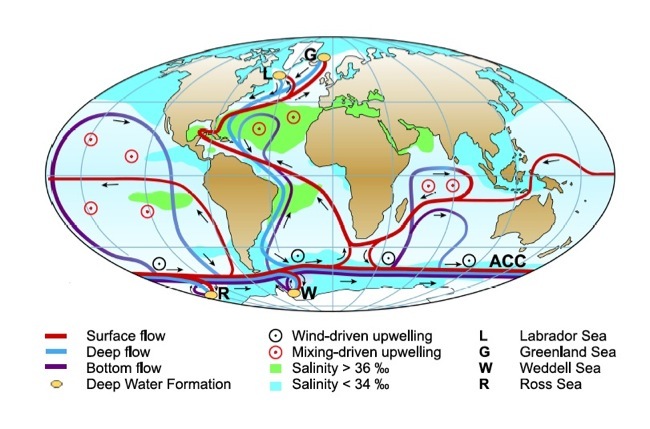 The thermohaline circulation is a very important process for heat transport within the ocean. Of the 5 PW of meridional heat transport required by the global energy budget, the ocean is estimated to carry 20 to 50% (and the atmosphere the remainder). At low and mid-latitudes most all of this heat transport is carried by the THC/MOC:, whereby warm, surface waters replace cold, deep waters.